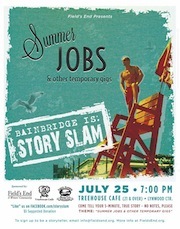 Note: Some of you kindly asked me to share the tale I told at Thursday night’s Bainbridge Island Story Slam. It was told on stage, no notes allowed—but I have reconstructed it here, as best as I could. When I was in college, one summer I worked in Yellowstone National Park. I worked in a gift shop at Old Faithful. We sold a lot of different souvenirs, but it’s the bedazzled sweatshirts I remember best. Sequined wolves, howling at a sequined moon. Tragically, our uniforms were gingham. Blue gingham blouses—and aprons. The only thing missing was the yellow brick road. My co-workers were all fellow college students and retirees, and we lived in a dorm above the store. In what I can only explain as some sort of crowd control scheme, we were all mixed in together—the students and the retirees. My roommate, for example, was a competitive bowler, actually named Flo, and I remember: on those beautiful Yellowstone nights, with no city lights to dim the stars, I could look down from my bunk…and see her teeth…sitting on the table next to the bed. Most of the college students were out there to hike. We’d leave as soon as our shifts were over and return just in time to start work again. And, if we’re being frank here, many of the college students were also out there to, um, hike a little bit of the Appalachian trail as they say. So, our hours were erratic. We’d come home late; we’d oversleep. We were a constant source of irritation to our more mature roommates. It might have all boiled over—these tensions between the students and the retirees—except for one strong, unifying force: the tourists. Now, many of you have probably been to Old Faithful. Some of you may even have a wolf-bedazzled sweatshirt. But when I say “tourists,” I’m not talking about you. It was these people, these tourists, who inspired us to set aside our differences and come together around a plan. And here is what we did: there was a wagon wheel hanging on the wall of the employee pub. We fixed it to the top of a post which we placed about twenty yards away from Old Faithful, just behind the boardwalk where people stand to watch. And just as Old Faithful was about to blow, two of my colleagues—in their blue gingham and their aprons—started to turn that wheel, very slowly at first…and then faster and faster. And only when Old Faithful erupted in all her glory did they stop, slumped in seeming exhaustion. The crowd cheered. There were a few wry, knowing smiles…but honestly not nearly as many as you’d like to see. I’ve been a part of many team-building exercises over the years, but nothing compares to the day we turned the geyser on. And the best part, for me anyway, was the rumor that it was all Flo’s idea.